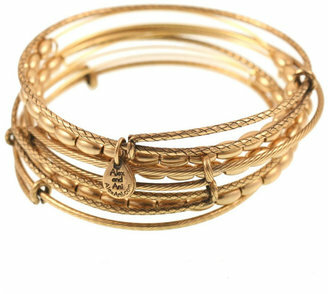 Alex and Ani's trademark adjustable bangles are a celebrity favorite for their casual-luxe look. Meaningful charms and pretty beads make these designer originals very tempting despite their hefty price-tag. The set above is available at CoutureCandy.com for $158 (use coupon code 20DAY for 20% off). 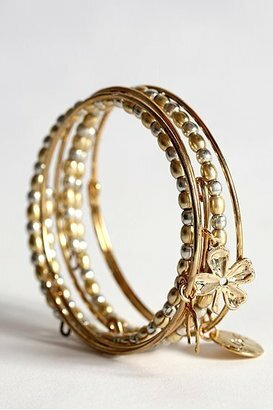 ...but if you just want a similar look for less, try these adjustable bangles available at Urban Outfitters for $24. Click the image above for details. Before: My nasty, bitten-to-the-bone fingernails before using Sally Hansen Miracle Cure. Recently, The Budget Beauty Babe (an alias) brought us her glowing review of Sally Hansen Miracle Cure for Severe Problem Nails. Encouraged by her positive experience with this product, I decided to see if I could get the same incredible results, especially since I was desperate to put an end to my on-and-off, incredibly nasty little habit of biting my nails. So I bought a bottle of Sally Hansen Miracle Cure in the beauty section of my local grocery store, and put it to the test. This stuff really IS amazing! It forms a rigid, protective coating on my nails which strengthens the nail and acts as a solid deterrent to nail biting. No more chips, tears, or breaking—all the things that used to happen to my nails on a daily basis, which would then cause me to pick at them (gross, I know) until they were practically non-existent. Above, you can see what my nails looked like when I began this experiment a few weeks ago. Keep reading to see my nails now!